This is traditionally the time of year when I start researching for the next school year. I'm a planner; it's just my personality. Although we are still thoroughly enjoying the current year of school, I've got the daily lesson plans for this entire year already entered into Homeschool Tracker Online. This means I don't really need to do a lot of planning except to decide which subjects we do each day based on Amber's abilities and available time. That leaves me free to think about how well the curriculum for each specific subject is going. I can evaluate if we need to definitely switch things up, or if it is something we don't love yet can stick with if something better isn't available. After I have my list of subjects that need to be addressed, or at least possibly changed, I begin the research. In some situations I already have a good idea of what we will move to because it was my second choice for the current year. Other subjects may be a real conundrum and take research. Now that Amber is over halfway through her first year of high school, it's a little different to change up her curriculum than in previous years. She has specific credits that need to be met with a guaranteed high school level of difficulty. Other courses do not need to be repeated once finished, so no matter how much we disliked (or loved) the curriculum, we won't use it again. What's up for consideration or research this year? Amber needs 1/2 credit of personal finance, ideally sometime 10th-12th grade. That suited us just fine since we didn't have a curriculum in mind for this. Amber has done some personal finance activities and participated last school year in the Junior Achievement Finance Park. While it was a great experience, it didn't give her near enough hours for the required 1/2 credit. There's also a bit more to personal finance than included in that program. I'm looking at a few choices right now. None of them are front-runners at the moment, which means we may end up pushing this off to her junior or senior year if we can't make a decision on curriculum. Our co-op does occasionally offer personal finance, but both Amber and I want more control over this topic than taking a co-op class allows. TruthQuest History - This would be entirely new to us. Mystery of History - which we used for ancient studies in Middle School and Amber already said she doesn't want to use it again for ancient studies in 11th grade. Tapestry of Grace - Re-evaluating, but it is still in the running. This subject is going to be the bane of my existence until Amber completes everything required. She loves learning about science topics while she greatly dislikes the way most textbooks and science curriculum teach. Tenth grade has been designated by Amber as the year for Chemistry. She's actually excited about the subject too, yet we are struggling to find a curriculum. I thought we had one. We reviewed Chemistry 101 earlier this school year and all seemed set to use it for 10th grade chemistry. Except... Amber isn't sure it is enough now. Not that it isn't difficult enough, but she isn't sure she likes the format of mostly video lessons. She's having trouble explaining her issues, but I think it stems from her need for a tactile experience in her learning. Chemistry 101 - mostly for the videos and not using the included study guide much. Guest Hollow: Chemistry in the Kitchen - without some of the extended activities, and sticking to the more scientific portions. I wasn't originally too worried about this entire category, but now that it looks like Amber will finish her entire 9th grade year without any hours put toward practical arts, I'm wondering exactly how she will earn an entire credit in this. Yes, if we are desperate her personal finance can go towards half of this credit. But did you notice above that we are not sure how she's going to earn personal finance either? The research goal for this subject is not to simply find a curriculum, but decide in what topical areas Amber could earn some practical arts credit. I might end up getting desperate and logging her occupational therapy time as practical arts, depending on what she does each session. 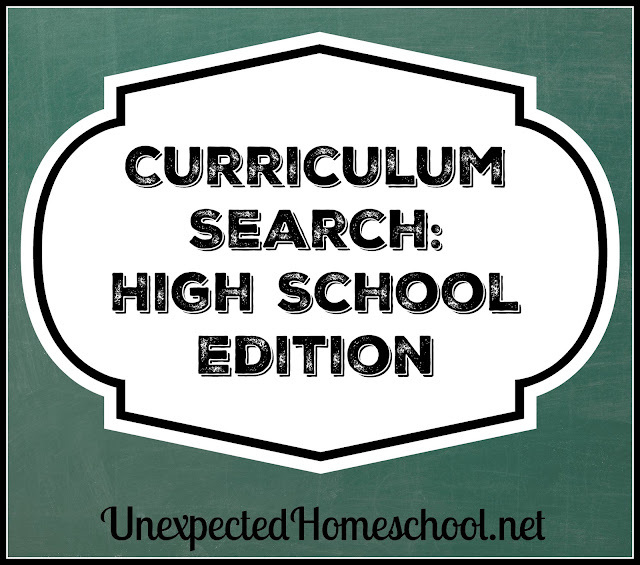 There are subjects for which I already know what we will be using different next year and do not need to search, and I'll document all of that later in a 10th grade curriculum wish list. But for now I desperately need to come up with answers for the subjects listed here.